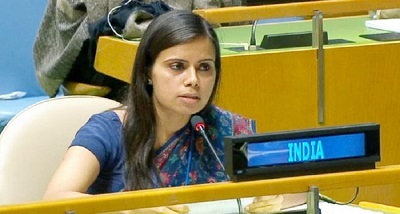 Counsellor in India's Permanent Mission to the UN Eenam Gambhir said at a UN General Assembly debate on the situation in Afghanistan, it is clear that the terrorists who plan attacks against Afghanistan are not interested in peace. In a thinly-veiled reference to Pakistan, Gambhir said, these offensives are planned and launched by those who are harboured in safe havens in the neighbourhood of Afghanistan. These sanctuaries have, for years, provided safety for the dark agendas of ideologically and operationally-fused terror networks like the Taliban, Haqqani network, Daesh, Al- Qaeda and its proscribed affiliates such as the Lashkar-e-Taiba and Jaish-e-Mohammed. The General Assembly held its annual debate on the situation in Afghanistan during which it adopted a resolution by a recorded vote of 124 in favour to none against, with three abstentions. Through the terms of the draft resolution, the Assembly pledged its continued support to Afghanistan as it rebuilds a stable, secure and economically self-sufficient State, free of terrorism and narcotics.